This post is about creating narrated presentations using a Chromebook. In education there are many purposes for creating narrated presentations, from creating Flipped videos to, to your students doing recorded oral presentations. The tools outlined below will allow you to put together video's that can record your audio and presentation materials. All the below videos were recorded using an Acer 720p with 4 gigs of ram. Screencasting will record everything that is happening on your desktop or tab. This can be combined with any application like Prezi or Google Slides to create oral presentations. This is also the most common way to create how-to type of video's. This is a simple Chrome extension that can record your current tab, desktop or even switch between tabs. It give you the option to add your video in the bottom right. Once done you can easily upload the video to Youtube or Google Drive. I find this very easy to use and is currently my favorite Screencasting tool. This is probably the most popular screencasting app for Chromebooks because it is made by TechSmith which is currently the top developer of these type of tools. However at this time I am really not a fan. It requires turning on extra settings and restarting your Chromebook, which I am sure will go away soon. There are less settings than Screencastify however I find it more clunky to navigate. I also don't know if it was SnagIT or my network but I had a lot of technical trouble creating the below screencast. You can't get much simpler. Go to upload, and choose via Webcamp. This will allow you to create a one shot video. I personally use Google Hangouts to connect with people from around the world on a weekly basis for my podcast. It is a great tool that allows you to connect with up to 15 people with video and interact live with those who are just watching. You can easily switch from a talking head to sharing your screen. If you so choose they can be recorded directly to YouTube. The video below is not one of mine but a student run show/helpdesk that +Kern Kelley hosts called Tech Sherpas. Movenote will allow you to speak, with a webcam preview, through your presentation. You can upload Google Presentations, PowerPoints, PDF files, and images. Once uploaded you can then mix and mesh them together to create the presentation you would like to narrate. SlideSpeech is very unique as it incooperates text to speech to create a narrated presentation. This is key for those students who are uncomfortable speaking or can't speak. This is a very fun tool, that allows you to create narrated animation type presentations. This is currently the popular web-based video editor, allowing you to upload several video's, add transitions and overlays. This is a very interesting approach that I found while looking for a stop motion tool for the chromebook. There is no audio but it will capture a portion of the screen and save it as a gif. Ctrl" + "Page Flipper Key"
The world is changing from the local to the cloud. Now how do you get there? Some people have said that businesses will never adopt the cloud completely, but take a look at the below video. 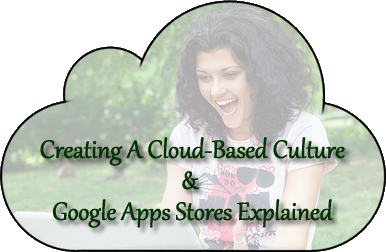 The world wide culture is in flux and ultimately the efficiency of the cloud will take over. What are some things we need to do? Step 1: Realize that Microsoft Office is not needed! ~ Everyone, including myself has to admit that Microsoft Office is a great program with many features that are hard to find in web-based applications. That said the collaborative nature of Google Apps (or even MS's web office) out weight many of the fancy features offered in locally installed applications. Step 2: Look for web-based alternatives! ~ It is important to never stop familiarizing yourself with alternatives. You need to look, even if you figure out that your current method is still the best. More on this below. Step 3: Stop printing! ~ But don't force a paperless classroom. Having a paperless classroom is not a directive, but more of an indicator, and welcome side effect, that many teachers should experience when effectively engaging students in the 1:1 environment. Step 4: Think collaboratively! ~ This is where pedagogy meets the cloud and the best reason to create a cloud based culture in your school. Step 5: Force yourself! ~ Making the switch to a cloud-based culture means taking the time to figure out the differences. It is easy to just do it the old way, but important that you stick with it. Looking for alternatives can be a challenge if you don't know where to look. Luckily Google has created several app stores that nicely categorizes many options out there. However there are several and each have their own purpose. ~ Designed to be the app store for the Chrome browser, however many of the links from the App section are just url's to webpages that can be accessed from any computer. ~ Domain administrators can distribute these to Chromebooks. Apps: These show up as icons in the Chrome browser new tab page, or in the Chrome start menu. Some of the apps integrate with Google Docs and will show up when you click "Create". Extensions: These only work with the Chrome browser but add many new features. Each user must sign into the browser itself, which is different then logging into Google Apps. Themes: Different themes for the Chrome browser. These are only installed by Domain Administrators. These are tools that the school would decide to launch for specific groups like all students. Installed apps from here will show up in the same menu that includes the Google Tools by your log on name, when you click "More". ~ Primarily designed for Android tablets, however the books, movies, and music sections will work on any device. Books (All devices): This is where you can look to find Textbooks. ~ Add-ons add functionality to either Documents or Spreadsheets. For example my gClassFolders spreadsheet add-on will automatically create student assignment folders for teachers. There are other add-ons for mail merges, and even Avery labels. What are some great apps? Here are some top edu app resources that you should explore. Upward Bound is a federally funded TRiO program that offers challenging pre-college experiences to student of high academic ability. Its goal is to generate skills and motivation necessary for success in high school and college through an academic year program and six-week summer residential program. I just read an article on how iPads change education. The article made some great points about access in the classroom, equity, and project based learning. The only issue is that the author attributed these to the iPad. I have read similar articles about Chromebooks. In all these articles I want to replace the word Chromebook or iPad, with the term 1:1. One-to-One is the culture that schools should be striving for. Once they have made that choice then creating articles like "Why my school chose the Android Tablet for our 1:1" would be a great follow up. Here is a portion of the initial 1:1 proposal I made to my school administration. Time for teachers to enhance lessons which benefit from students having 1:1 devices and to integrate the technology into their instructional practice. Provide on-demand access to electronic resources in the classroom. Align with common core standards’ electronic communications expectations. Allow students to document and express themselves using digital resources. Teachers will use Google Docs and digital resources to distribute and receive student work. Teachers will use the approach of “always access” instead of “always on”. Teachers will look for digital resources to supplement or replace their current paper, thus providing better access and more differentiated resources, while requiring less printing from multiple devices. Students will need to have full access to Google Docs and the Chrome Browser. Only web-based software will be expected to be used with the device. Alternative Labs will still need to be maintained, for specialized teaching needs and use. A 1:1 committee has been established to build the rollout procedure. The expected lifespan of a 1:1 device is 2 years. This is due to the extra wear and tear of daily use from students. Specific use policies will need to be created for these devices in addition to current school policies. Some type of insurance will need to be designed. Either a 3rd party insurance or extra devices. Establish lead teachers to volunteer their classrooms as observation centers for other teachers. This was the information I provided when proposing the 1:1 to our school. 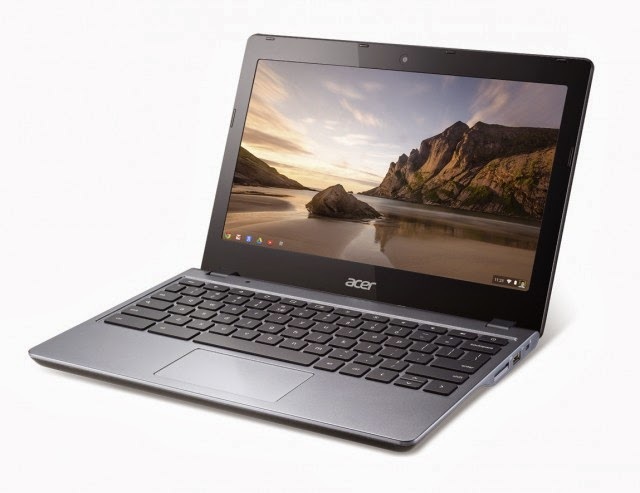 Obviously my device expectations lends itself to a Chromebook, but when I first collaborated with teachers Chromebooks were not an option and we wound up looking just at Windows, Linux or Mac laptops (iPads did not meet our requirement for the full Google Apps Suite). When going with 1:1 the most important decision you can make is not the device but how you want students and teachers to collaborate together. In the proposal above we decided on the Google Apps For Education Suite. We could have chosen Evernote, or what ever Microsoft is calling their suite, or pages, or an LMS like Edu20. This collaboration is what will define the culture you create. 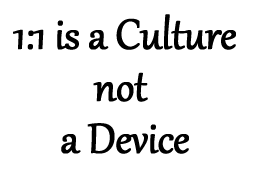 Once your collaboration method is chosen then you can look for a device that works best with that culture. 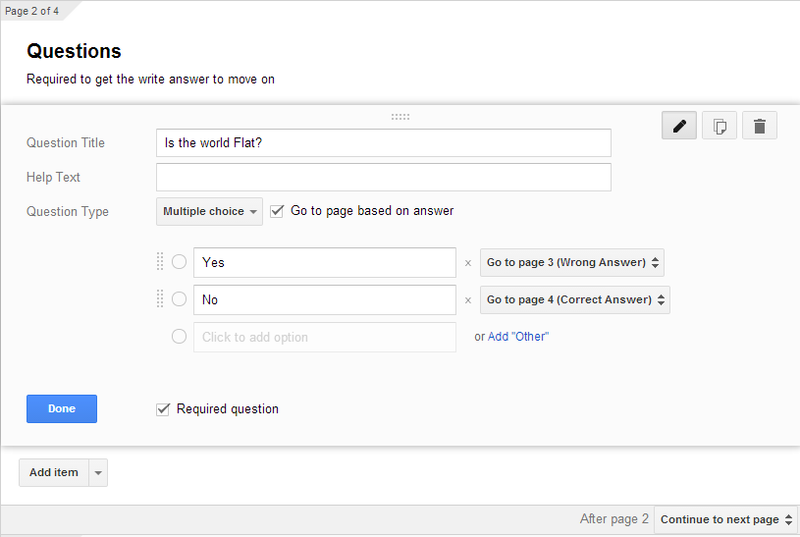 Here is a method to require the correct answer to move on using a Google form. This same method can also be used to password protect a form. This method was suggested by +Elizabeth McCarthy. Whether you are flipping your classroom, differentiating your curriculum, providing on-you-own-time training or having students digitise their oral presentations, creating narrated presentations are a very important skill in education now. This workshop I will demonstrate some tools that work on many devices including Chromebooks. Many educators have found that YouTube is a great place to get information, which it is. But there is a lot of benefits you can provide to your classroom if you learn to upload. Once you take that leap you will find that YouTube is much more than just a repository of video’s, but allows you to edit videos, create slideshows, record directly from the webcam and even insert questions or links on to video’s. This workshop will showcase some of those advanced features of YouTube that many may not even know exists. It would seem that a device that is web-only would seem limiting. The truth is that there are many things you can do from graphic editing, movie editing, to typing and more. In this workshop I will start off by showcasing and exploring the Chrome Webstore. This is a precursor to creating a cloud-based culture within your school. This is a set of Google Templates for ePortfolios and Student Learning plans as well as a Google template for teacher curriculum maps. The idea of PATH was a way to bring all these elements together into one cohesive plan that can be implemented easily. One of the highlights of the common core is a focus on digital collaboration. Google Apps is an ideal tool for this collaboration but it changes the dynamics of the classroom. This session I will speak about classroom workflow when using GAFE and introduce the gClassFolders I designed for easily creating student folders. This course is designed as an icebreaker for those who are comfortable using Google Apps and would like to take it a step further. More schools are being encouraged to teach coding to students and Google Apps offers a very simple easy to access scripting tool that is built into their product. These scripts can be used to enhance workflow, or automate repetitive tasks. The idea of flipping your classroom is to give the teacher more in-class work time with their students by digitizing the learning material so students can view on their own. This is a course that will expose you to the concept of flipping your classroom, connect you with other flippers, and let you learn the tools and methods so that you can flip your own class. By the end of the course you will have built a flipped unit for your own class. This was a fun show where I got my dad +Uwe Behrendt to come in and record an episode with me. We talked about his moving here from Germany as a young child, and my own childhood adventures. He recently went to the Phillipeans where my step mother is from and brought back some great incite on that trip. We also talked about his Artwork http://uwesart.blogspot.com and his blog http://www.uwesshop.com.